Earth is called Blue Planet | Why Earth looks Blue in Color ? Let’s see the reason why Earth is called Blue Planet. When you look at Earth from the Moon it looks very blue, largely due to the Earth’s atmosphere being blue and the ocean’s reflecting the atmosphere’s blue color. The Earth is referred to as “the blue planet” because of the abundance of water on the planet. Over 70 percent of the Earth’s surface is comprised of water, producing a vivid blue color when viewed from space. The Earth’s oceans contain about 1.3 billion cubic kilometers of space, which is 95 percent of all habitable area on the planet. In addition to covering most of the Earth’s surface area, the oceans provide habitat to somewhere between 700,000 and 1 million species. Many barriers to exploring the oceans still exist and as many as two-thirds of marine species have yet to be identified. This makes the oceans one of the last remaining unexplored frontiers of science. Take the color “blue”. It is not that ‘why is Earth called the blue planet’ is a difficult question to answer. We could simply say that Earth seems blue because oceans cover two-thirds to three -quarters of the planet. But that would be true if the water was blue, which is not really the case, nor does it make sense to claim that the Earth looks blue because oceans reflect the blue sky. At best, that only deflects the question to our having to answer as to why the sky is blue, specifically, as to why the clearer the sky is the bluer it appears! 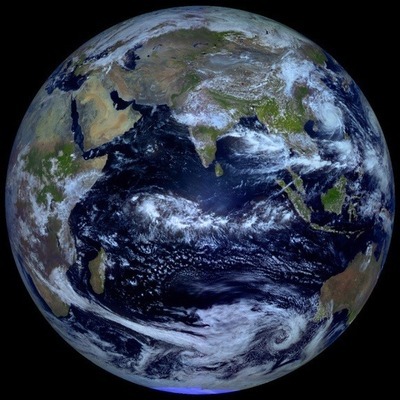 Indeed, the Earth does seem blue when viewed from the outer space, except for the white patches of polar ice caps and the cloud cover. But global warming would someday melt the polar ice, judging from the observed thinning of the Arctic and that should only add to the Earth’s existing bluish tint. Interestingly, the scattering of light is the real reason why this is so. Light travels in waves and the part of the electromagnetic spectrum known as ‘visible light’ have wavelengths that range from 380 nm (violet) to 750 nm (red). The corresponding frequencies are 790 to 400 THz. The light comes from the sun in a spectrum of colors but the blue light has shorter wavelengths. Much of those short wavelengths are absorbed by the gas molecules in the air. These molecules radiate the absorbed blue light in different directions, scattering it all around the Earth. The ocean looks blue on sunny days because it reflects the blue color of the sky.